High summer is just about best time to enjoy juicy, flavorful stone fruits like plums. Prunus domestica and its popular domestic, European, and Japanese cultivars are flowering deciduous trees from the rose family, as are closely related peaches, apricots, and almonds. The fruit of the plum is referred to botanically as a drupe. Its seed is surrounded by a stony pit, which is encased in juicy yellow or red flesh. Plum skin ranges in color, including shades of green and gold, but the most familiar hues are dark blue, purple, and crimson. 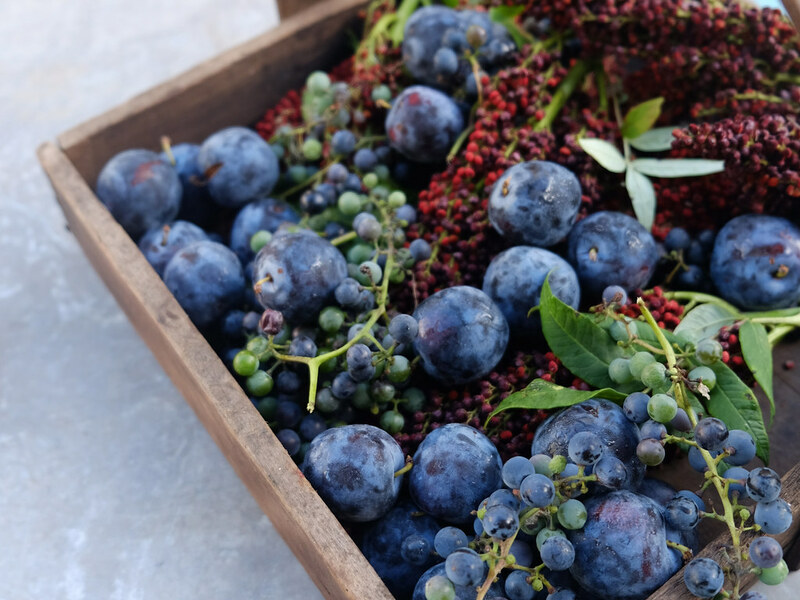 Although some plums come into season earlier, the bounty of European selections arrives in August and provides a seasonal bridge to autumn, when other fruits such as sun-ripened grapes begin to appear. When selecting plums, always choose those with taut skin and firm flesh that yields easily to a gentle squeeze. If you have plums that are a bit too firm to split open and pit easily, place them in a paper bag and store them at room temperature for a few days to encourage ripening. 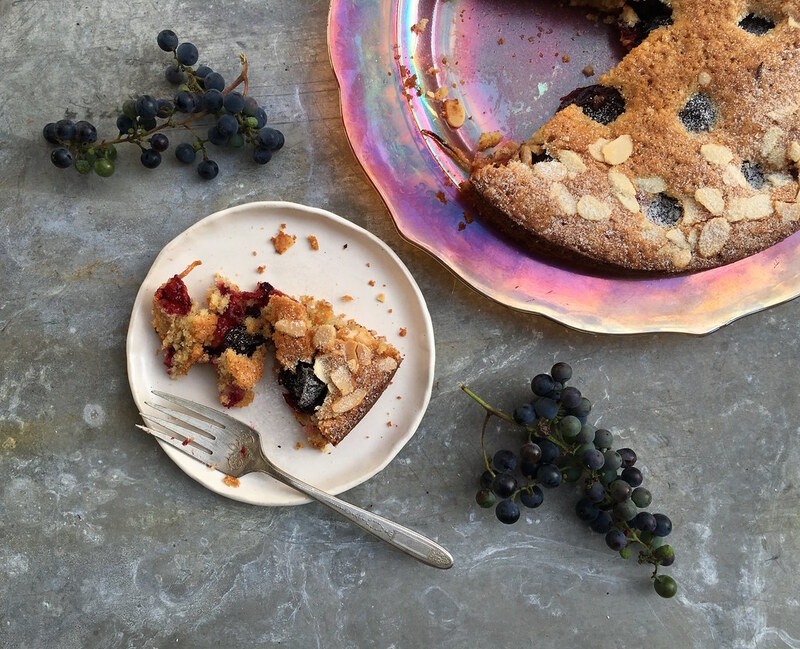 This easily assembled, slightly sweet torte may be adapted to use other fruits, depending on what is freshest and most abundant: Firm blueberries and wild or Concord grapes are two wonderful substitutions. Although most plums would be wonderful used here, I prefer small, dry-fleshed, tart-skinned blue damsons for their excellent baking performance. Preheat oven to 350°F. Butter the sides and bottom of a nonstick 9-inch springform pan or cake tin. If using a cake tin, line the bottom with parchment cut to fit, and butter the parchment before dusting lightly with flour, tapping to rid any excess. In a medium bowl, whisk together the dry ingredients until well combined. In a separate large bowl, cream together the butter and sugar with a handheld mixer on medium speed until almost fluffy, about 3 to 4 minutes. Add the vanilla extract and the eggs to the bowl one at a time and continue beating until the mixture is smooth, thick, and evenly incorporated. Fold the dry ingredients into the wet a third at a time until just combined, being careful not to overmix. Spread the thick batter into the pan, and then place the plums cut side down into the batter. Sprinkle the almonds over the cake and bake for 45 to 50 minutes, or until a toothpick inserted into the center tests clean. Remove from the oven and allow to rest for 5 minutes before removing the sides of the springform pan. Serve the torte warm or at room temperature, dusted with powdered sugar if you like. Try substituting almond paste for some of the sugar and omit the cinnamon, or use crystalized ginger instead of part of the sugar.